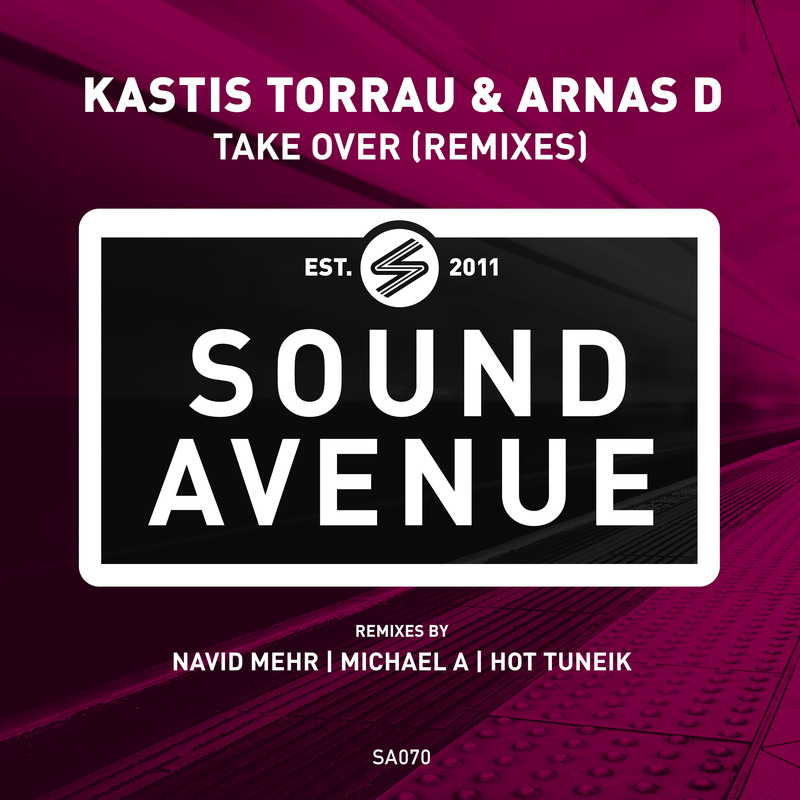 The latest release on Madloch’s Sound Avenue finds the label showcasing new interpretations of ‘Take Over’ by Kastis Torrau & Arnas D.
Originally released in June of 2014 the track quickly shot to the top of Beatport’s Progressive House chart as well as the label’s best sellers Top 10. Praise from Sasha and Hernan Cattaneo made it a hot commodity all through the summer season and it still sits as one of the duo’s most electrifying productions to date. Now over two years later Sound Avenue calls upon Navid Mehr, Michael A and Hot TuneiK to reinterpret the track for 2016. When you hear people talk about the new landscape of progressive house Navid Mehr is usually one of the first names that gets dropped. The Canadian artist owns releases on Asymmetric Recordings, Soundteller Records and Hernan Cattaneo’s Sudbeat Music. His penchant for warm, melodious grooves has earned him legions of new fans and a volume controlled release schedule keeps him one of the most in demand remixers. Here he puts his own unique twist on ‘Take Over’ bringing a warm, fluid approach that once again hits on just the right emotional level. The rhythmic qualities and clustered stabs from the original shine through in the foundation as droning synths bring several poignant moments along the way. Bright and vibrant, the main break proves to be a highlight with cinematic swells and a vortex of noise ultimately sealing a magnificent conclusion. Another brilliant remix from one of the brightest stars in progressive house. Michael A is no stranger to Sound Avenue having contributed both original and remix material in the past. Here the Belarus based artist and Genesis Music label boss steps up amidst support from Hernan Cattaneo, Nick Warren, Guy J and Guy Mantzur to deliver yet another brilliant remix. Taking a deeper and darker approach Michael complements Navid’s mix nicely and still brings an underlying emotion in the process. Backed by an electric, club friendly groove it’s clear the Belarus based artist has a keen sense of dance floor dynamics. Wavering arps and trailing electronics fill the air as soft chords bring moments of divine bliss. Void of any major break it’s buzzing vibe and timely melancholic’s make it one of Michael’s biggest and most sought after remixes of 2016. The third and final interpretation of ‘Take Over’ finds Diego Carreón aka Hot TuneiK returning to the label for his fourth appearance. The Mexican artist and Hookah Records boss has quickly become a primary contributor to the Belgian imprint over the last year. Most recently he reworked Kieran J’s ‘Wave Therapy’ into a spiritual dance floor journey and now works similar magic on ‘Take Over’. The Mexican’s big, beefy grooves are a thing of beauty and he’s crafted another perfectly contoured foundation here. Rough and rugged it chugs along as ethereal atmosphere’s slowly encompass the framework. Clattering drums bring a mesmerizing cadence as electric stabs pierce the air. A beatless second act highlights the mix with percussive loops building a steady, dramatic tension before one final rush seals a brilliant finale. Another huge remix from Hot TuneiK which rounds out a superb remix package from Madloch’s Sound Avenue. Don’t miss it.